Depending on where you live, the weather outside can get pretty frightful during the winter months. Plunging temperatures, snow and ice can pose problems both indoors and out, and older adults are at a higher risk for injuries and other weather-related health issues. You can minimize cold-weather dangers simply by being prepared. All it takes is a little planning and attention to your surroundings. Following are some tips – for seniors and for everyone – for staying safe this winter. Seniors are more prone to injury from a slip or fall. In fact, the National Safety Council reports that falls are the leading cause of injury-related death for adults ages 65 and older. Snow and ice can compound the problem, making even a simple walk to the mailbox treacherous. The best protection is to stay indoors when sidewalks and roads are covered in winter white. But if you must venture out, be sure to wear shoes or boots with good traction. Stay on walkways that have been cleared and treated with salt, and use handrails or a cane for added stability. When you return inside, remove shoes right away to prevent melted snow and ice from being tracked throughout the house and creating slippery conditions inside. Shoveling snow is a job everyone loves to hate. And for older adults, it may be a job best left to someone else. Data from the Cleveland Clinic show that shoveling snow sends more than 11,000 people to the hospital each year. For many, shoveling can cause orthopedic injury. For others, it can trigger a heart attack. Shoveling wet, heavy snow can put unnecessary strain on your heart, forcing it to work harder to keep you warm. And if you have problems with balance or osteoporosis, shoveling can be especially hazardous. Don’t hesitate to enlist help. If you must shovel, work in short shifts, don’t overload the shovel and dress in warm layers to protect yourself from the elements. Frigid temperatures can be more than unbearable – they can be downright dangerous. It goes without saying that if you’re going to be outside for an extended period of time, you need to be warmly dressed — heavy coat, hat, gloves, scarf, warm socks and boots. Without the proper attire, you risk frostbite to exposed skin and an unsafe drop in body temperature, known as hypothermia, which can result in death. Older adults are at a higher risk of hypothermia due to changes that happen as your body ages. Your best bet is to stay indoors, don’t let the inside temperature of your home dip too low (keep at 65 degrees or warmer) and limit outside exposure to short trips. When it comes to winter driving, it’s a good idea to follow the Boy Scout motto: Be prepared. Have your vehicle serviced and winterized so it’s ready for less-than-optimal driving conditions. Be sure to check the oil, antifreeze, tires, battery and wipers. If you have snow tires, get them into the rotation. Assemble an emergency kit to keep in your trunk with a few basic supplies: blankets, jumper cables, windshield scraper, small shovel, rock salt or cat litter (for tire traction if you get stuck), water and non-perishable food, flashlight and first aid kit. If you must drive in winter weather, be especially careful on overpasses, bridges and ramps, which tend to freeze before roads. Consider taking an alternate route to avoid roads that aren’t well-traveled or cleared. Always take your cellphone so you can reach out for help in case of an emergency. The best place to be on a cold, snowy day is in the warm comfort of your own home. Older adults come from a generation that’s familiar with and often prefers the use of alternate heat sources, such as fireplaces, gas heaters and wood stoves. But these sources can be hazardous if not safely managed. According to the U.S. Fire Administration, heating is the second-leading cause of house fires, trailing only cooking. Fires confined to chimneys, flues or fuel burners account for 84 percent of home heating fires. Before you fire up your heating devices for the season, make sure they’re properly maintained, cleaned and vented. If not, you run the risk of exposure to carbon monoxide, a deadly gas that you can’t see or smell. Make sure you have both smoke and carbon monoxide detectors in your home, and test the batteries frequently. If you’re using a space heater, be sure to keep it at least three feet away from anything that can burn (curtains, rugs, bedding, furniture, etc.). Helping fight Old Man Winter. The best tip for staying safe during the cold winter months is to ask for help when you need it. Whether it’s assistance with snow removal, a ride to the grocery store or doctor’s appointment, or help arranging a service technician for your car or home heating device, you don’t have to tackle these tasks on your own. FirstLight can help. 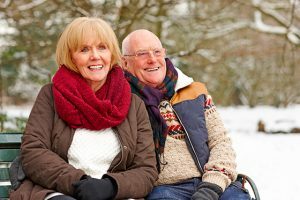 With awareness and pre-planning, seniors can safely maintain their independence at home, no matter what challenges Old Man Winter throws their way.